A leading indicator of societal progress is how young people are faring in their transition to adulthood. Rooted in the human development and capabilities approach, Measure of America tracks the nation’s status on young adult development and studies the risk and resiliency factors that cause and prevent youth disconnection. For opportunity youth, this time of emerging adulthood—the teens and early twenties—is when people build many of the capabilities required for a good life through their experiences, classes, sports clubs, camps, internships and jobs. These connections lay the groundwork for a freely chosen rewarding life. Opportunity youth are often cut off from many of these critical resources. On a national level the youth disconnection rate declined from its peak during the Great Recession, but the rate of decline slowed down between 2016 and 2017 (the most recent year for which there is data). San Diego County is seeing a similar pattern, except that our rate of improvement accelerated according to the most recent data. 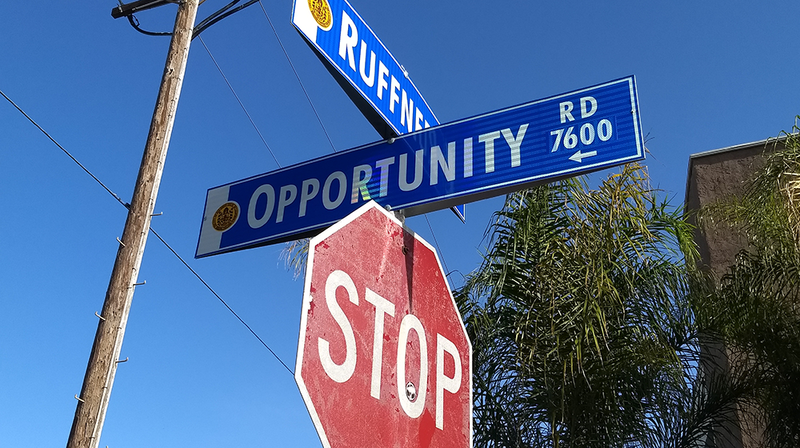 Our county had slightly fewer than 37,000 opportunity youth in 2017, compared to 41,000 in 2016—representing 8.6 percent of all young adults 16-24 in San Diego County who are neither working nor in school. “To give perspective, last year we could easily fill Petco Park with opportunity youth,” said Laura Kohn, Director of CLIMB (Center for Local Income Mobility) at the Workforce Partnership. “This year, the stadium isn’t quite as jam-packed, but it’s still a near sell-out crowd.” With our rapid progress from 2016 to 2017, we are now on track to exceed the 2020 “cut the rate” goal. 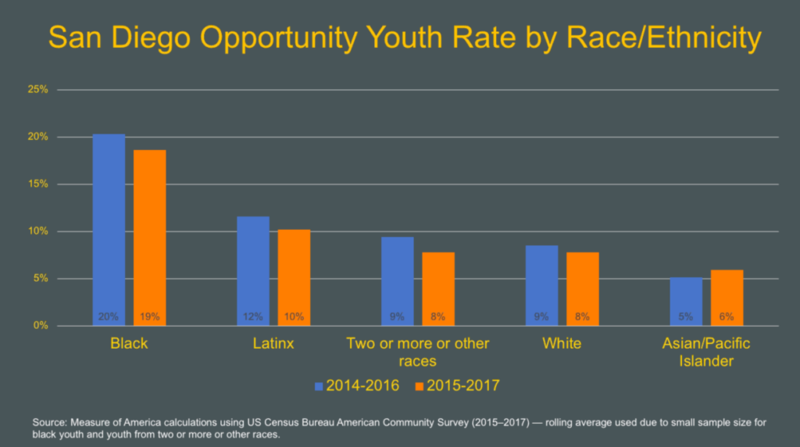 Data shows the disconnection rate declined or stayed the same for all racial and ethnic groups except Asian/Pacific Islanders between 2016 and 2017 in San Diego County, even though disconnection increased for black youth on a national level. 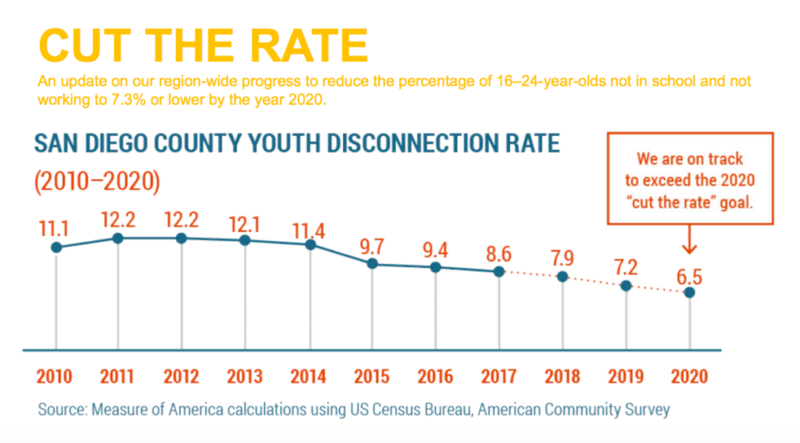 Although our overall rate of youth disconnection made some great gains from 2015 to 2017, what we measure for this equity goal is the difference between the community with the highest rate of disconnection in San Diego County and the county average. 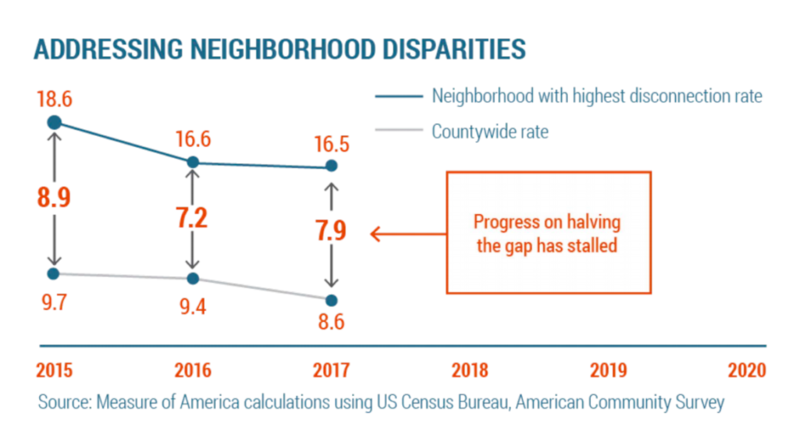 Data shows there wasn’t a significant difference between that highest disconnection community in 2018 and now, while we made really good gains on the county average. At this time, our progress in closing the gap has stalled. For more on the San Diego County youth disconnection data, watch the full webinar. To join the conversation on this important topic during two breakout sessions with Measure of America and to get a first look at the full research report, register by April 18 for the May 2 Opportunity Summit 2019 at the Town and County San Diego in Mission Valley.